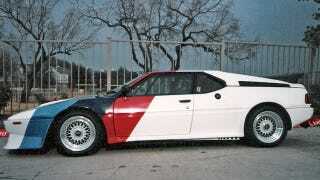 As it was winding down its M1 racecar program in 1982, BMW built 10 street-legal, higher-powered copies dubbed the M1 AHG, meant only for its racers. The sole example with BMW's racing colors will hit an auction next month. Born from a stillborn collaboration between Lamborghini and BMW, the mid-engine M1 was used by BMW to run a spec Prodrive series in 1979 and 1980, mainly as a feeder to Formula 1. The inline six-cylinder engine that made 273 hp in regular M1s was boosted to 350 hp for the M1 AHGs, which also received flared bodywork all around, racing clutch, a freer-flowing exhaust and special BBS wheels. This particular example was last up for sale in 1996 for what now seems like a bargain basement price of $350,000. Leake Auctions will put it under the hammer during its auction June 10-12 in Tulsa.